Page 1 : Général organisation. This training course is opened to any person who regularly practices choir singing. Led by volunteer choir singing specialists, the course proposes particularly low tariffs while ensuring high-quality teaching. Its contents are based on the learning of an original repertory leading to the presentation of concerts within the exceptional surroundings of Ariège-Pyrénées. Beginning and end of the training course. Welcoming of the trainees will be Saturday July the 16th. since 3 p.m. A welcome meeting is scheduled after diner Saturday at 8.30 p.m. The training course begins Sunday July 17th. at 9.30 a.m. The training course will finish Tuesday august the 26th. after the concert. The departure of the trainees is scheduled Wednesday July the 27st. after breakfast . Given the soberness of the setting, excessive accessories should be avoided. 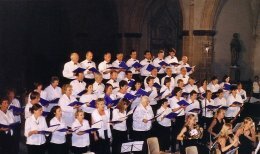 Open on the romantic repertoire, the program of the year 2004 propose different works which must be sung in full choir or in optional workshops. If so, works which will be sung depend on the wokshop which will be choosen. Agregated Master of the University in Musical Education and Choral Music in Foix, 1st price in Musical Formation and Choral Conducting, Dominique Jean GRETILLAT is also Pedagogical Counsellor with the University of TOULOUSE. He has conducted the Vocal Ensemble Ariège-Pyrénées from 1980 to 1999 with whom he has performed some of the greatest works for soloists, choir and orchestra (Bach's cantates, Mozart, Schubert, and Rossini's Mess, Charpentier and Lesueur's Te Deum, Fauré and Berlioz's Requiem, Vivaldi's Gloria, etc. With this ensemble, he performs in all of Europe (Germany, Austria, Belgium, Spain, Estonia, Italy, Finland, The Netherlands, Portugal). He has founded and conducted an International Choral Festival " the Musical and Choral Meeting of Mirepoix and Ariège " Member of the Author, Composer and Music Editor Society, he also has composed pedagogical scores for Drum Ensemble and Piano, has created a handbook of Musical Education and many arrangements for the choir. He founded in January 2000 a new choir, the "Maitrise Gabriel Fauré" and the European Choral Academy of Ariège. The training course takes place in FOIX 80 Kms south of TOULOUSE, west of CARCASSONNE and north of the Principality of ANDORRA. Air link : Airport of TOULOUSE-BLAGNAC. Road link : Route N. 20 connecting TOULOUSE to ANDORRE. 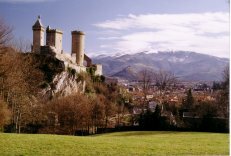 The city of FOIX is the capital city of the area ARIÈGE reconciling the charms of a small provincial town to the assets of a country centre. Dominated by its medieval castle, it offers to the walker the lanes of the old city with its half-timbered houses, its fountains, its old shops, its grain markets, the St Volusien abbey, the banks of the Ariège and the Arget. It is also a shopping and cultural centre with its large stores, its Cultural Centre as well as the Museum of Ariège. The summer is also the time for great festivals, in particular its " sounds and lights " display which is the biggest in all the South of France : " Il était une FOIX, l'ARIEGE ". Near the city, they is also the underground river of Labouiche, " the Forges of Pyrene " and its Museum of Old Trades. A little further is " the Pyrenean Park of Prehistoric Art " and the fabulous caves of Lombrives, Niaux, Bedheillac, La Vache, Le Mas d'Azil. In going North one finds the towns of Pamiers (Fatherland of the composer Gabriel Fauré) and Mirepoix (and its half-timbered houses). 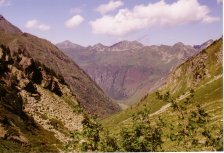 Lastly, there are the infinite pleasures of the mountains which are offered to summer tourist who is avid for imposing and preserved landscapes of " the Wild Frontier ". 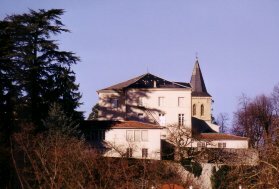 The activities of the European Choral Academy take place in the University Centre of Ariège in FOIX. This centre is equipped with modern and adapted structures and facilities (amphitheatre, classrooms, library…) and offers an exceptional setting opening on the mountain. There, the composer Gabriel FAURE lived child as a child. The bust of the musician can be found next to the old chapel in the middle of the centenary cedars of its park.